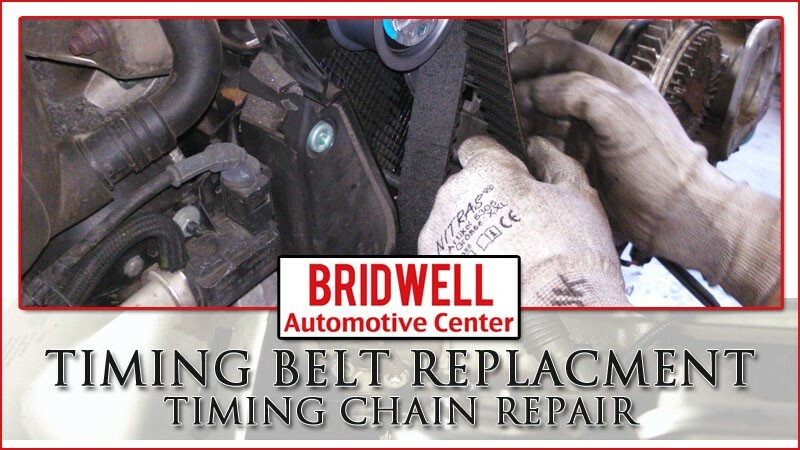 If you are searching for “timing chain replacement near me” “timing chain repair shops near me” “timing belt replacement near me” “timing belt service shop near me” or “timing belt repair near me” in Scottsdale, Bridwell Automotive Center can help! Give us a call today at (480) 948-4781, Get a quote using our contact form or stop by our auto repair shop located at 7171 E Lincoln Dr. Scottsdale, Arizona 85253. Your automobile has a timing belt and it is important to keep it maintained to avoid breakage or slippage that could hard your vehicle’s engine. If the timing belt fails, it will have a disastrous effect on your vehicle’s valve train. For many automobiles, the vehicle manufacturer usually provides a mileage limit to let you know when timing belt maintenance is needed. Although, even if you stick to the manufacturers schedule, it is still possible that your automobile could end up requiring timing belt replacement early. Looking for the most common signs of timing belt failures can help you prevent damage to your engine. If your automobile has a timing chain it usually only needs to be replaced when certain symptoms are present. It is also important to replace any word timing shaft chains and balance shaft chains sat the same time. You can prolong the life of your timing chain by ensuring you have regular oil changes and keeping the oil level topped off. In some cases oil keeps the chain tensioner under proper tension and over time this can wear too. Looking for the most common signs of needing timing chain replacement can help prevent damage to your engine. Watching for the following warning signs will help you spot problems with your timing belt or timing chain. If you notice any of the following timing belt or chain problems, bring your vehicle into a repair shop immediately. HOW MUCH DOES TIMING CHAIN REPLACEMENT COST? Our automotive mechanics can diagnose your timing chain or belt to troubleshoot what the problem is and offer repair or replacement services to fix it for you. Our diagnostic process will also help identify any other issues that might be contributing to the signs you let us know about during the consultation. The total time it takes to replace the timing belt all depends on the timing apparatus your vehicle uses. General speaking, timing belts take much less time to replace than timing chains because timing chains are placed inside the engine.